An engineer named Mel Bartholomew invented an entirely new type of gardening in the 1970s: the square foot garden. This new and intensive gardening method uses 80 percent less soil and water and about 90 percent less work than traditional gardens. 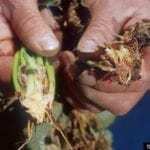 The concept behind square foot gardening is to plant a certain number of seeds or seedlings in each of a series of foot-square garden sections. There are either 1, 4, 9 or 16 plants in each square, and how many plants per square foot depends on what variety of plant is in the soil. Square foot garden plots are set up in grids of 4 x 4 squares, or 2 x 4 if set up against a wall. Strings or thin pieces of wood are attached to the frame to divide the plot into equal square foot sections. One type of vegetable plant is planted in each section. If vine plants are grown, they’re generally placed in the back to allow for a straight trellis to be installed at the very back of the bed. When calculating plants per square foot, the most important thing to consider is the size of each adult plant. In the initial planning stages, you may want to consult a plant per square foot guide, but this will only give you a general idea of garden plans. 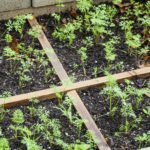 You’ll rarely have a garden book or website with you in the yard, so figuring out your own plant spacing in a square foot garden is an essential thing to learn. Look on the back of the seed packet or on the tab in the seedling pot. You’ll see two different planting distance numbers. These are based on old-school row planting plans and assume you will have a wide space in between rows. You can ignore this larger number in the instructions and simply concentrate on the smaller one. If, for instance, your carrot seeds packet recommends 3 inches apart for the smaller number, this is how close you can get on all sides and still grow healthy carrots. Divide the number of inches per distance you need into 12 inches, the size of your plot. For carrots, the answer is 4. This number applies to horizontal rows in the square, as well as vertical. This means that you fill the square with four rows of four plants each, or 16 carrot plants. This method works for any plant. If you find a range of distance, such as from 4 to 6 inches, use the smaller number. If you find the rare fraction in your answer, fudge it a little bit and get as close to the answer as you can. Plant spacing in a square foot garden is art, after all, not science.